It was another busy weekend for DHS athletes. The Senior Girls volleyball team captured the top spot in their annual home tournament, dropping St. Thomas Aquinas in the final match 25-20 and 25-17 to win the gold. 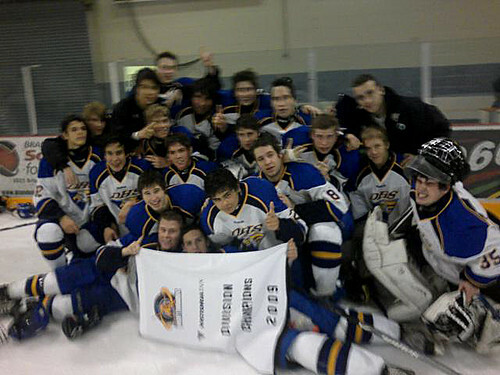 The Boys Hockey team was in Brandon for the 19th Annual Genesis Hospitality High School Hockey Tournament. The Boys won the “B” side final with a 2-0 win over Sturgeon Heights. Coach Oltsher said that it was a “very successful weekend with the team going 4-1 overall”. Oltsher also said that they were very happy with the effort all weekend, and the team learned a lot. In Girls Hockey, the Eagles were down against the Fort Frances Muskies 1-0 early on, before coming back to defeat the Muskies 2-1 Saturday. The Wrestling team traveled to Winnipeg where they were the overall medal leader on the weekend. Great work teams! Dryden High School is proud of your accomplishments.